When Kembe came home, he showed up with hutzpa. He swaggered through the house, acting like (say it with me now:) he owned the place. We were amazed that this little boy was weathering so much change with such confidence. A couple weeks in, that confidence started feeling a little more bossy. Demanding. Controlling. I started feeling like Kembe was treating me like an employee instead of a parent. When he wanted something, he demanded it. Immediately. He had the other kids doing his bidding. Older kids would come over for playdates and somehow Kembe would wind up in charge. He pulled me into power struggles over everything. It felt a little like Lord of the Flies. And he and I were fighting for the conch. Kembe’s swagger was in full force. Only now it seemed . . . cocky and obnoxious? Mark and I started jokingly referring to an SNL sketch to describe some of his behavior. There was a video about an illogical guy who threw everything he didn’t like on the ground with an “in your face” attitude. Seriously, it was exactly how Kembe acted when he didn’t get his way. There were many irrational tantrums where Mark and I would turn to each other and mouth, “I threw it on the ground!” Which was helpful, because laughing about his behavior often kept me from crying about it. After Kembe was home for about a month, we started tightening the reigns on discipline a bit. We were still trying to go easy, and still trying to provide him with lots of opportunities to be in control, but we felt like we needed to establish some authority. He was incredibly disappointed to learn that he would not, in fact, be in charge of the house. Things got worse. One night, in a bleary-eyed moment of insomnia and frustration with our family dynamics, I started reading up on attachment issues. The resources I found so clearly described what I was seeing. A sense of entitlement . . .arrogance . . . . inappropriately demanding . . . fighting for control over everything . . .
Now, I don’t believe Kembe has reactive attachment disorder. But in the world of adoption, there is a long a complicated middle ground between healthy attachment and RAD, and Kembe . . . he’s right there in the middle. Yes, I know all three-year-olds exhibit entitlement, control issues, and tantrums. But this is different. India fights for control as an attached child who is figuring out her own autonomy. Kembe fights for control out of fear. A child who is not securely attached does not trust others. And a child who does not trust will not allow an adult to be the boss. It is too scary for them to relinquish control over to another person. And while Kembe learned to cope in his world by being bossy and charming and demanding, he also needs to learn to trust and submit to us as parents now that he is in a family. Because a three-year-old with entitlement issues might be cute, but a seven-year-old with entitlement issues is annoying. A teenager with entitlement issues is a danger to self and others. An adult with entitlement issues . .
Yeah. Let’s just extinguish the entitlement issues. So we find ourselves faced with the daily (hourly) task of teaching Kembe that indeed, we are in charge and trustworthy to be his authority. We are submitting to the experts in the field, and the experts in the field advise a pretty staunch approach to discipline. As in, NO, I AM THE BOSS HERE, ALL DAY EVERY DAY, AND YOU WILL OBEY ME AND DID I MENTION THAT I AM THE BOSS. It has been a pretty radical shift in our parenting style, and at first it felt really harsh. I am humbly learning that the parent strategies that are affective with untraumatized children are not always what a child struggling with attachment needs. Counting to five, assigning time outs, giving two choices . . . these things were not working. Our discipline right now is swift and authoritarian, and our tether is short, as he learns that he cannot be the alpha dog in the family. We try to address his behaviors in a calm and loving way. Sometimes we fail. And in the in-between, we offer a lot of praise, affirmation, and affection. As we started implementing this approach, I noticed how truly affected Kembe was in terms of trust issues. To the point where, a simple request for him to change his verbage from “Give me some water!” to “Can I have some water please?” would cause him to squirm and lose eye contact and look like someone had just deflated his entire sense of self. Just because he is that uncomfortable with relinquishing control and asking for something instead of ordering something. I AM THE BOSS AND IN CHARGE HERE. (So I keep saying, as lovingly as possible). We are a couple months into this Operation Establish Authority thing, and we have seen huge changes. Huge. As much as he kicked and pushed against our authority, we are slowly seeing him relax into it. Like a child who tires out from a tantrum, and gives way to being comforted. He is allowing himself to be the child, and allowing himself to be parented. He seems less anxious, and more content. We are all getting along better. He’s even taken to pointing to me with a coy smile as he says, you’re the boss, I’m the kid. Almost with a little glee. Like it is clicking – this family thing. Now mind you, that glee does not always stay, and I find myself repeating some variation of I AM THE BOSS AND YOU MUST OBEY ME many, many times a day. I am sure I look like an insanely mean mom to people outside of our family. That’s okay. We’re building a family . 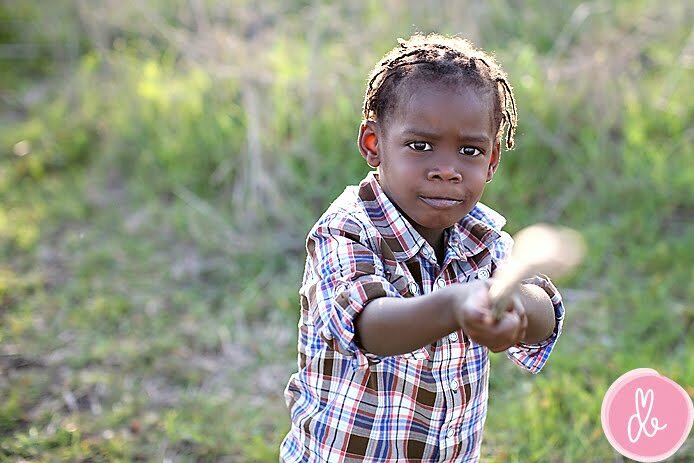 . . and Kembe needs to know that his parents are in control. There is security for him in that knowledge. But . . . he’s also lost the swagger. That silly, endearing, obnoxious swagger. He seems like a gentler kid. A more respectful kid. A more attached kid. All of this is good. But I want to make sure that his leadership, charisma, and confidence remain intact, too. I want to affirm him for the strength and resiliency he has shown at such a young age. So, I work hard to gain his trust as a parent. But I’m kind of hoping to get that swagger back, too.